Preheat oven to 425ºF. Melt the butter in a saucepan over medium heat. Add the orange zest, cinnamon, and nutmeg; mix well with a wooden spoon. Add the apples and cranberries, stirring to combine. Combine sugar, pecans, and flour in a separate bowl; add to apple mixture, stirring to combine. 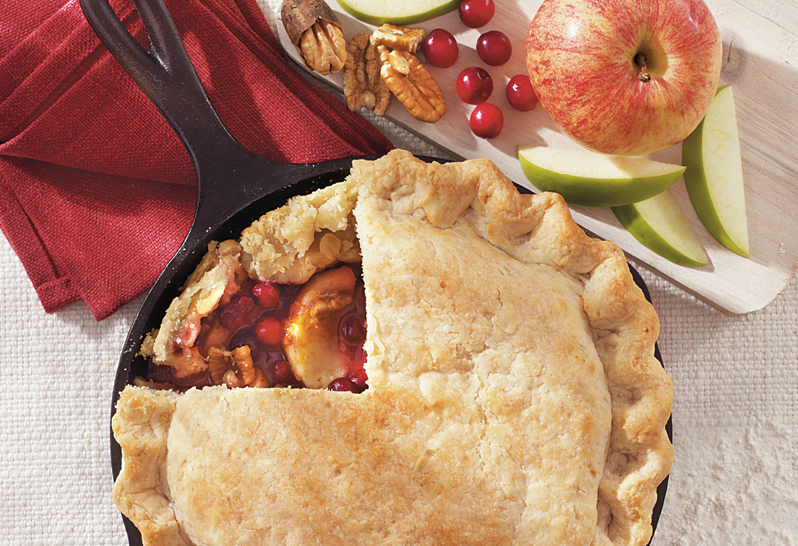 Line a 10 inch Lodge Cast-Iron Skillet with rolled out dough to form the bottom pie crust. Spoon apple mixture onto pie crust, packing tightly and mounding the center. Roll out remaining dough to 1/8 inch thickness and gently place over filling; fold edges under and crimp together, sealing both layers of crust together. How do I make the dough you ask? See our Nana Hirl’s Pie Crust post for recipe and directions. Cut 4 or 5 slits in top of pie for steam to escape. Bake at 425ºF for 15 minutes; reduce oven temperature to 350ºF and bake until crust is golden, approx. 45-55 mins. Transfer to a wire rack and cool 1 1/2 to 2 hours before serving.